Wang Yi expressed that China and Papua New Guinea are friends and partners enjoying mutual trust and sincerity. Under joint guidance of the leaders of the two countries, China-Papua New Guinea relations have constantly achieved progress along the right direction. The Chinese side advocates that, all countries, big or small, are equal. 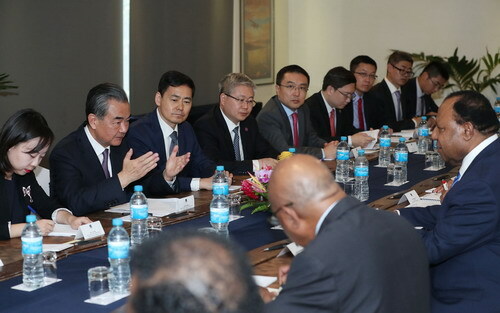 The Chinese side supports Papua New Guinea in hosting the Asia-Pacific Economic Cooperation (APEC) Economic Leaders' Meeting and renders assistance in this regard within its capacity, and believes that Papua New Guinea has wisdom and ability to successfully host a distinctive APEC Economic Leaders' Meeting to increase its international influence and that of the Pacific Island countries. President Xi Jinping's visit to Papua New Guinea and attendance at the APEC Economic Leaders' Meeting are of milestone significance for the relations between China and Papua New Guinea as well as between China and the Pacific Island countries. The Chinese side stands ready to work with Papua New Guinea to intensify communication and coordination, and step up discussion and preparation to ensure a complete success of President Xi Jinping's attendance at the meeting and visit. Wang Yi expressed that the Chinese side puts Papua New Guinea in an important position in China's neighborhood diplomacy, and stands ready to become a lasting and trustworthy friend and partner of Papua New Guinea. Having full confidence in the future of Papua New Guinea, we are willing to, in accordance with national conditions and needs of Papua New Guinea, enhance cooperation in the joint building of the Belt and Road Initiative, production capacity, investment,agriculture, industrial modernization and other fields, help Papua New Guinea translate its resource advantages into development ones, and assist Papua New Guinea in improving its capacity in independent and sustainable development. Mr. Foreign Minister is welcome to travel to China for the first China International Import Expo next month and Papua New Guinea is welcome to export more products with its own national features to China. Rimbink Pato expressed that Papua New Guinea and China enjoy profound and traditional friendship. Papua New Guinea attaches great importance to its relations with China, and thanks the Chinese side for its long-term, generous, and selfless assistance for the economic and social development of Papua New Guinea. Papua New Guinea will firmly adhere to and earnestly implement the one-China policy, unswervingly support the just stance of the Chinese side on issues concerning China's core interests, and steadfastly support the Belt and Road Initiative of the Chinese side. Papua New Guinea hopes to learn from China's successful experience in poverty reduction and development, and reinforce practical cooperation in economy, trade, investment, energy resources, infrastructure and other fields. It is believed that Papua New Guinea-China relations will set an example for the relations between the Pacific Island countries and China, and promote stability and development in Papua New Guinea and the region of the Pacific Island countries. I am looking forward to travelling to China for the first China International Import Expo next month.